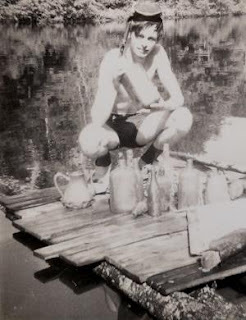 This may be my favorite photo from Growin’ Up in Maine, and was taken on the Sebec River in Derby at the end of a treaure hunt around 1961. The picture is yours truly in a very rare photograph of a log raft typical of what we built each summer. She may look rough, but rafting, fishing, or diving off one of these was pure joy. The odd length boards covering the raft were harvested late night while crawling on our bellies and dragging a few each from a neighbor’s scrap lumber pile. They were ours for the asking, but our method was a lot more fun than hand picking a few in broad daylight. The dozen or so antique bottles shown came from the bottom of the Sebec River. Our technique was simple. A team of two manning poles would power the raft upstream to the island near Goulds pasture, and then anchor the log raft offshore with a big rock tied by rope. The snorkle, mask, and swim fins allowed us to keep submerged swimming for long stretches searching for treasure. An antique perfume bottle c.1890 that I collected on one excursion was valued at $125 in 1961 according to one price guide. Spring thaw and flood conditions plus natural erosion provided a new crop of bottles every year! In case you’re wondering, the number of defective bottles cracked or broken were extremely few. This is a moment I should relive while I can.